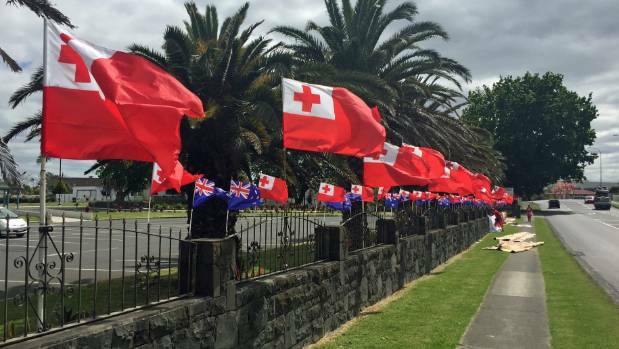 The Free Wesleyan Church of Tonga in New Zealand decorated their stone fence line with flags of Tonga and New Zealand. Excitement is building in south Auckland ahead of the Australian and Tongan rugby league test this weekend. 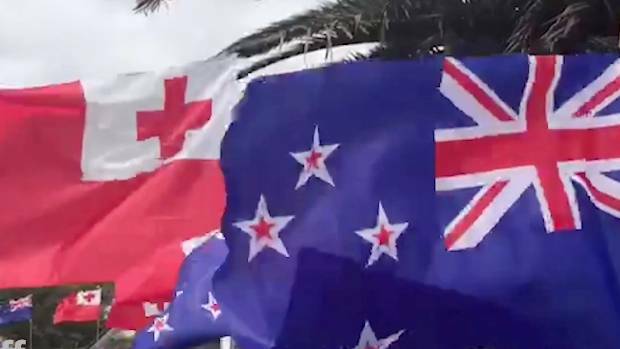 The flags are flying, but authorities and community leaders are mindful of the tensions seen during last year's Rugby World Cup where some supporters' celebrations got out of hand. The message is clear: have fun and celebrate, but be mindful of others. Last year drew controversy from both sides, with some jubilant fans criticised for their after-match behaviour. Meanwhile, the Tongan community lashed out at media coverage of the celebrations. Police area commander Inspector Naila Hassan said the Labour Weekend game was a big occasion for the Tongan community. Volunteers Fatima Fanguna, left, and Mafileo Teu putting up the tapa cloth in Favona. "We encourage fans to enjoy themselves but not at the expense of members of the public, business owners and residents of Ōtāhuhu," she said. Hassan said there would be an increased police presence around Mt Smart Stadium and the town centre on Saturday. "Our priority is to ensure that the public is safe." 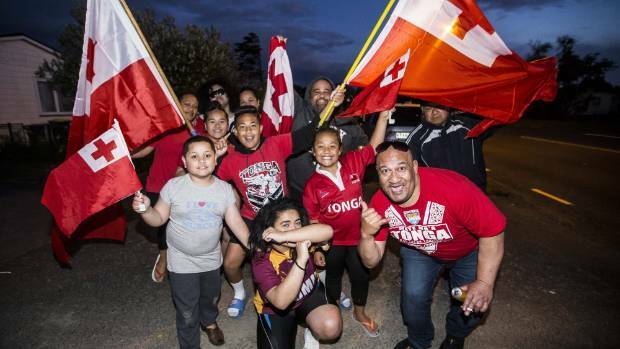 Mate Ma'a Tonga fans took to the streets to celebrate during the Rugby League World Cup last year. Hassan wouldn't comment on specific plans but expected there could be some traffic congestion. That meant there was a possibility of road closures but no decisions had been made, Hassan said. "Motorists may wish to avoid the area in the latter part of next week as a precaution." 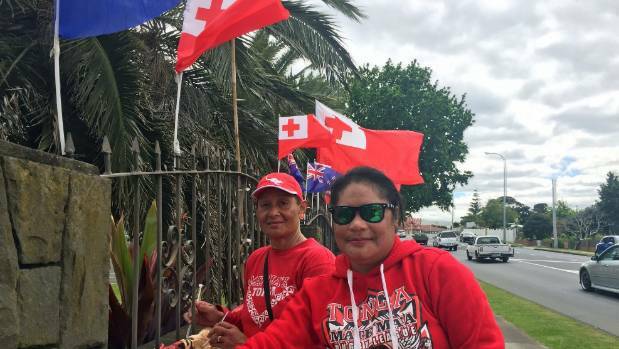 The flags flying outside Free Wesleyan Church in Favona are proving a popular attraction in south Auckland. Last week, Counties Manukau police launched bi-lingual videos on its Facebook page - one in Tongan and one in English. "This is an exciting opportunity for our Tongan community," Manu Fotu said in the video. "But we also ask for everyone to act responsibly and with consideration for others," Reverend Tevita Finau said. Flags fly outside Free Wesleyan Church of Tonga in Favona. Manukau ward councillor Alf Filipaina described the fanfare in one word - "awesome". "Just awesome is the only word to describe it," he said. "It's so cool to see such passion and pride for our little country and these champion players and to showcase our culture." Filipaina echoed other sentiments about crowd safety in the build up to the match. "The last thing we want is for a great event like this to be overshadowed by people pointing the finger at our community over something silly." On the game itself, Filipaina predicted it would be a close and competitive match. An Auckland Transport (AT) spokesperson said it would be monitoring congestion in the area on Saturday. Travel to the game on trains and Northern Express buses would be a free with a match ticket from 4.45pm. On Saturday, Beasley Ave and Station Rd would be closed between 8am-11pm. Flags have been waving outside houses and atop cars for weeks. In Favona, the Free Wesleyan Church of Tonga in New Zealand is setting the standard for flags. It's a sea of red and blue along the top of nearly 100 metres of stone fence, with Tongan and New Zealand flags. Church volunteers Fatima Fanguna and Mafileo Teu added to the spectacle by fixing valuable pieces of tapa to the wall last week. It's proving quite a spectacle for drivers travelling along Favona Rd with many sounding their horns in support. Steward Sione Tagi said the church was continuing the trend it set during the Rugby League World Cup last year. "It's a way of showing our support for Tonga as well as New Zealand," he said. "Fatima Fanguna and Mafileo Teu volunteered to do all the decorating themselves - they're doing a great job."